With its long, sharp, chisel-like beak, the big woodpecker knocks large rectangular holes into trees in search of ants and beetle larvae. It uses its long, barbed, sticky tongue to capture the insects. It also excavates cavities for its nest with multiple escape routes for safety. Other animals, including the Wood Duck, use the cavities built by the Pileated Woodpecker. The bird is monogamous and pairs stay together year round. The female lays three to five white eggs, and both male and female take turns incubating them. Like other woodpeckers, it has an undulating manner of flying. 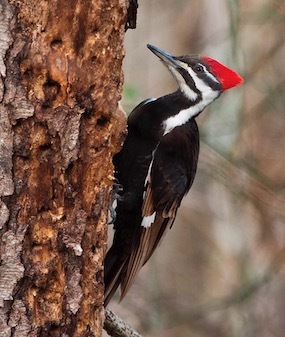 The Pileated Woodpecker looks a lot like the cartoon figure Woody the Woodpecker. Though the woodpecker has many other wonderful features, we want to focus on its pecking. It is able to peck 20 times per second and can do this 12,000 times in a day. These are not gentle pecks. The creature’s beak strikes the tree at a speed of 15 miles per hour and produces an incredible G-force of 1,200. This “is the equivalent of going from 26,000 miles per hour to a complete stop every second” (“Bird Brains,” Forbes, Jan. 6, 2016). A human, on the other hand, can sustain a maximum G-force of 100, and brain injury and death often occur at much lower forces. So the little bird can sustain G-forces on its brain of more than 100 times that of a human. First, its brain is much smaller than a human brain. Dr. Lorna Gibson, a materials science professor at MIT who has studied woodpeckers, says, “A human brain has a mass of 1,400 grams. A woodpecker’s brain is only 2 grams. That’s the mass of two paperclips. It is a scaling phenomenon. While this might seem like a highfalutin concept, this is something that we instinctually understand. If you dropped your cellphone from your nightstand, it would survive. But if you dropped your laptop from the same height, you might have to take a trip to the Apple store. The same goes for brains: The smaller the brain, the better its chance of surviving an impact” (“Why Don’t Woodpeckers Get Concussions?” Huffington Post, Nov. 25, 2013). Second, its skull is made of plate-like bones with a “spongy” structure at strategic locations to protect the brain. “At a microscopic level, woodpeckers have a large number of trabeculae, tiny beamlike projections of bone that form the mineral ‘mesh’ that makes up this spongy bone plate. These trabeculae are also closer together than they are in the skylark skull, suggesting this microstructure acts as armor protecting the brain” (“Why Don’t Woodpeckers?” LiveScience, Apr. 10, 2012). Third, the woodpecker’s brain fits tightly into the skull (unlike the human brain) so that it doesn’t “slosh” around and cause damage. Sixth, the woodpecker’s beak is cleverly built to absorb energy while still allowing the little creature to punch holes in wood. “The upper and lower halves of the birds’ beaks were uneven, and as force was transmitted from the tip of the beak into the bone, this asymmetry lowered the load that made it as far as the brain” (“How Woodpeckers Avoid Head Injury,” BBC News, Oct. 27, 2011). Seventh, the woodpecker changes the direction of its pecking attack by moving its head and beak around in just the right way as it hammers. By this means, woodpeckers “minimize the number of times in a row that the brain and skull make contact at the same point” (“Why Woodpeckers Don’t Get Brain Damage?” Mental Floss, Nov. 24, 2014). Smart! Eighth, the woodpecker uses its entire body to absorb the energy of the pecking. They “hit their targets in a straight, consistent line” and “with each hit, the entire body of the bird knows what motion will take place, which muscles will be used and any rotation that would cause strain is avoided” (Forbes). Researchers have found that through these mechanisms, “99.7 percent of the impact energy from striking a tree is absorbed by the body” (Mental Floss). Other design features include a nictitating membrane that closes over the eye a fraction of a second before its beak strikes wood, thus protecting the eye from debris, cleaning it, and conveniently keeping it from popping out of the creature’s head! The woodpecker also has bristles on its nostrils and special air sacs to prevent inhalation of wood particles. This is a ridiculous statement from every perspective. How could a creature survive to “evolve” something that is necessary for its very existence? And how could such things evolve? Evolutionists have proposed zero scientifically-supported evolutionary mechanisms that could build up the vast and mind-bogglingly complex DNA sequences necessary to create complex organs. “Natural selection” is not creative. It can only select from existing genetic code. “Mutations” aren’t creative; they are overwhelmingly destructive. Believe me, you don’t want to pass on mutations to your offspring. I’m glad that I can be my own scientist and weigh the facts for myself. I accept the fascinating true science that has enabled the discovery of these things about the woodpecker (e.g., scanning electron microscopes, CT scanners, force/torque sensors, high-speed cameras, computer simulations, 3D modeling), but I reject the “philosophy pretending to be science” that is haphazardly tossed into these reports. For those who have eyes to see, the woodpecker is irrefutable evidence of an Almighty, all-wise Creator. To know Him personally, I recommend my favorite book, the Bible, which is the gracious revelation of God’s character and plan of salvation to mankind through Jesus Christ.